The platform is updated to support even more features for web apps, such as sharing (via SMS and email) and deeper integration with Twitter. iBuildapp has improved it's web applications performance: they're now optimized for faster load time and better user experience. Now there are even more ways to share your content with the world: we've added a feature to let people share news, events, tweets, and your contact info via email or SMS. Come back to iBuildApp.com to start editing your improved web app today. New API for mobile app building services facilitates development of apps that can access iBuildApp services remotely without logging into an account. 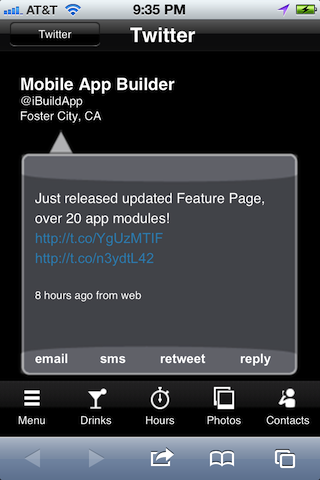 iBuildapp today launched the beta version of its API for remote app management. The initiative allows developers to manage their apps (create, retrieve, update or delete content such as photos, news, or events) built using iBuildApp platform without needing to log in to the iBuildApp platform. The web service description is available at http://ibuildapp.com/api.howto.php. Build Your Mobile App for Free!